1 Axolotls are a special kind of salamander. They live in Lake Xochimilco. This lake is near Mexico City. Axolotls aren't the same as most other salamanders. Axolotls spend their whole lives in water. They are happy to stay near the bottom of the lake. 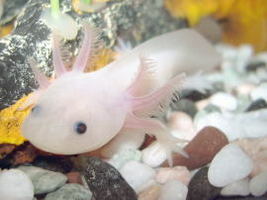 2 The axolotl has a special condition known as neoteny. The axolotl doesn't go through a complete metamorphosis. It never loses its dorsal fin. The axolotl uses external gills to breathe. The gills look like feathers sticking out of the back of the axolotl's head. The head is wide. Another interesting feature is that the axolotl's eyes don't have lids. 3 Axolotls also have a special ability to regenerate their body parts. The axolotl doesn't grow scar tissue to heal a wound. Instead it grows a new body part.